This stunning 500m rock route rising from the Garden of Allah has great rock and pro on the roped pitches, is safe and easily rapped. Strongly recommended by the first ascentionists. The climb entails access via an apron on the RH side to a large ledge before a full pitch of superb 18. Above this a half pitch on easy ground leads to scrambling to the superb headwall pitches (16 & 18). A short step down to another wall not visible from below accesses the crux pitch of 21 (watch the loose blocks at the crux). Above this, stunning easy pitches (15 & 15) lead to a final scramble to the summit. To descend rap to the base of the crux pitch and scramble toward the easy side and down across easier ground continuing to the top of the first pitch and rap back to the ledge and down climb back to the snow. Along John Pascoe Ridge from Mt Tyndall Grade 1+ Easy snow slopes provide access along the Main Divide from the upper Garden of Allah, bypassing Snowy Peak. From the col between Tyndall and Newton a snow ridge with a schrund and short scramble at the end leads to the summit. The schrund can cause parties problems and at times cut access. A diagonal snow climb from the Garden of Eden up crevassed snowslopes that vary considerably and are often cut off later in the season. There are some big slots up here. Reach the ridge between Newton and Tyndall from which both peaks are accessible. 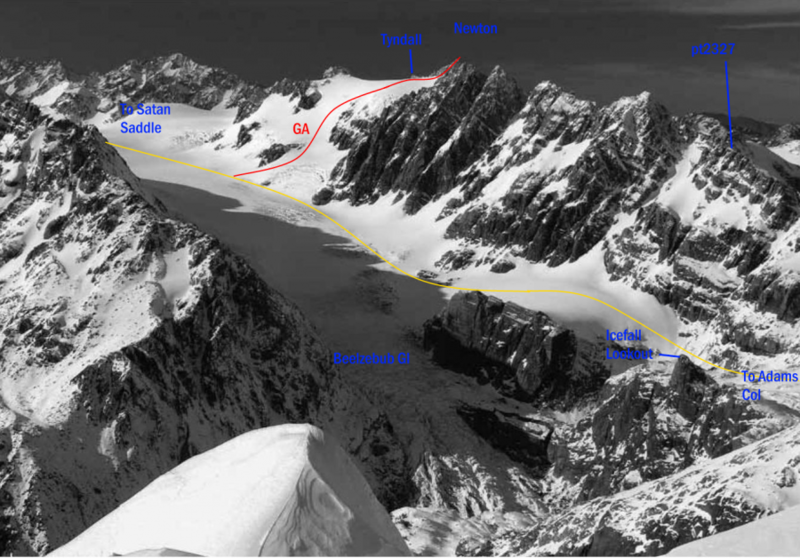 The first ascent went all the way up the Colin Campbell Glacier from the Frances Valley to the Garden of Eden, then climbed the snowy south face of Tyndall before traversing to Newton Pk. LK Wilson, HW Cormack, Dec 1933.